Either way, the One S still offers top of the line specs (minus the screen size and resolution) and appeals to many. 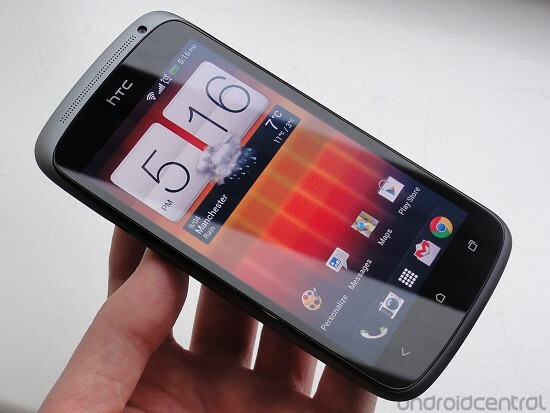 Although keep in mind that T-Mobiles rumored HTC One X+ may be around the corner so you may want to save your upgrade until then. The T-Mobile HTC One S smartphone had just been released recently and it’s more than lived up to it’s billing of being a solid buy. While it’s no doubt a good device out of the box, there is the noticeable issue of significant battery drain while using the WiFi calling feature. Apparently, the battery seems to drain faster while being on a WiFi-based call— which points out to a software issue somewhere. To that end, HTC and T-Mobile have acted quickly to ensure this isn’t a continuing problem and are currently working on a minor software patch which is aimed to improve the battery life of the device when making WiFi calls. No word on when exactly this patch will hit the devices but hey, we always welcome software updates which offer an improved experience for owners— so we won’t mind the wait. 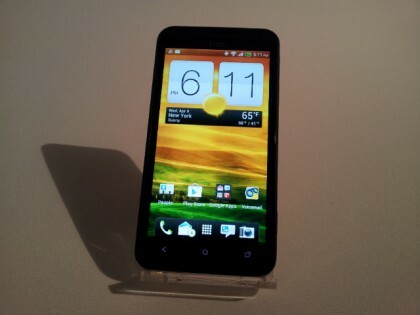 Well gang the time has come if you’ve been anticipating the official arrival of the T-Mobile HTC One S smartphone. T-Mobile has unleashed the smartphone and now lists the device for a smooth $199.99 (after a $50 mail-in rebate) on-contract or $599.99 outright. In case you’ve forgotten, the device features a snappy 1.5GHz dual-core Snapdragon S4 processor, Android 4.0 + Sense 4.0, Beats Audio and some impressive camera software for you folks who love taking quality photos. Let’s see how long it is before T-Mobile sells out of this puppy. Feel free to hit the source link below or your local T-Mo store to grab one for yourself. But first, make sure you check out our initial hands-on and thoughts for the smartphone. Getting stoked to pick up the HTC One S from T-Mobile on April 25th? Well check this out! Costco is currently taking pre-orders for the device and is shooting to beat out T-Mobile’s price of $199.99 after rebate. Not only will you get to bypass the $50 mail-in, you will also save an extra 10 bucks and get a $25 Costco cash card to boot! Pretty sweet deal, huh? This is still going to beat out Best Buy’s retail price of $199.99, too. In order to snag the $25 cash card you are going to have to mail in a rebate form, but once she arrives at your door you could spend it on a slick accessory for your new One S! Hit up the source link below for more deets. 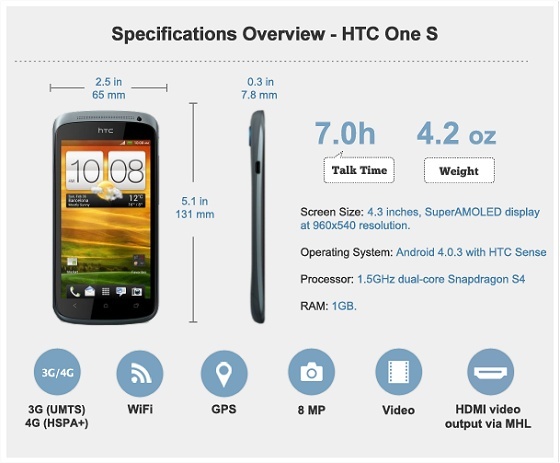 Today T-Mobile announced their highly anticipated flagship device, the HTC One S. The One S is the middle brother of the new popular One family from HTC and packs tons of features all in a super slim form factor. And though there are few cons with the device, such as the lack of a removable battery, no memory expansion and a pentile display, it’s still a power device not to be reckoned with. Talk Android was in New York live for the unveiling event and we got our hands on the juicy handset for your viewing pleasure. Check out the hands-on video from our cool rep Matt and don’t forget to let us know what you think of the device in the comments below. To quickly recap the features of the handset, it’s sporting a 4.3-inch Super AMOLED qHD (960 x 540) display with Gorilla Glass technology, Beats Audio integration, 16GB of on-board memory and ICS 4.0 with the new HTC Sense 4. And under the hood you’ll find a dual-core 1.5 Krait CPU with an Adreno 225 GPU. You can snag this guy for $199 on a two year contract on April 25th but in the meantime, check out the hands-on video. HTC knows it has to deliver in 2012. The past few months haven’t been kind to the veteran Android manufacturer, with tumbling revenues and unrelenting competition from Samsung and Apple. And so, as it hopes to reclaim some lost glory, HTC has launched its new range of “hero” handsets, the HTC One series. Much of the media attention since the HTC One announcement at Mobile World Congress has been focused on the new flagship product, the One X. And with good reason — the One X is a fantastic phone, and one that makes smartphone history as the world’s first quad-core handset. But equally alluring is the X’s smaller, sleeker sibling, the HTC One S — a 7.8mm-thick, metal-framed device powered by a next-gen Snapdragon processor. Unlike the polycarbonate-clad One X, the One S retains the classic HTC aluminum unibody design, with both vanilla and plasma-fried flavors unveiled at MWC. Though it lacks the pin-sharp 720p display found on the One X, the One S nevertheless is a premium product. But now that it’s actually available to purchase, where does the 4.3-inch One S fit in the broader Android landscape, and has HTC been able to cram all this high-end hardware into the phone’s slender shell without compromising in other areas? 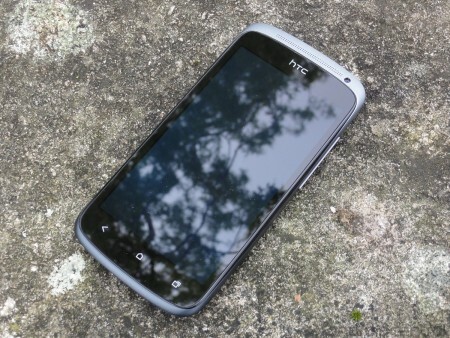 Find out after the break, in our definitive HTC One S review. An unbelievably thin phone with superlative build quality. Performance is speedy thanks to the Snapdragon S4 CPU. There’s also the same fantastic camera that’s found in the One X, and great battery life to boot. HTC Sense 4 compliments ICS rather than replacing it. USB storage is limited to 10GB. Although superior to other PenTile displays, the One S’s qHD screen will be a turn-off for some, as will the lack of removable storage and battery. The One S will inevitably live in the shadow of its big brother, but it’d be foolish to overlook this device. Despite its position in the middle of the HTC One series, this is no mid-range handset. The One S is a smaller, sleeker, leaner version of the X (with much better battery life, we might add), and it’s just as capable a smartphone as HTC’s new flagship. If you can get past the lower screen resolution, it’s definitely worth a look. Before we dive into specifications and build quality, it’s worth getting to grips with exactly how thin the HTC One S actually is. At 7.8mm, it shames both the Galaxy S II (8.7mm) and Galaxy Nexus (8.94mm). And although it doesn’t quite beat the Droid RAZR’s 7.1mm, it also doesn’t include any unsightly bulges or raised areas — the camera lens protrudes ever so slightly from the back, and that’s about it. HTC is well-known for its use of aluminum unibody construction in its high-end smartphones, and this long-standing tradition is continued in the One S. Like the Sensation before it, the One S features a smooth, rounded aluminum frame that’s interrupted only by a couple of soft-touch areas where the antennae are housed. You get the picture — it’s thin, well-built and feels great in the hand. And as for weight, the One S isn’t quite the lightest phone around, at just under 120 grams, but it doesn’t feel any heavier than it needs to be. In a smartphone world dominated by black plastic slabs, there’s something refreshing about the colder, metallic look and feel of the One S. And as is always the case with leading HTC phones, the One S’s build quality is exemplary. We alluded to two flavors of One S in our intro, and depending on which color you pick, the phone’s chassis will have undergone a completely different finishing process. The gray version, which we’re reviewing here, features a traditional aluminum shell with “gradient paint color sheet” finish. The black version is a little more exotic, with a “micro arc oxidation” coating. Essentially, HTC takes the same aluminum shell and fries it in plasma, turning the outside coating into a ceramic. The result is a slightly rougher, matte feel compared to the grey version’s smooth finish. A word of warning, though — we’ve noticed that the black version seems a little more prone to knocks and scrapes than the gray variant, so accident-prone users may want to bear that in mind. Encased within the phone’s aluminum (or ceramic) chassis is its 4.3-inch qHD Super AMOLED display. It’s a step back from the current crop of 4.7-inch, 720p phones, and if you’ve used any of these higher-resolution devices, then going back to qHD is going to take a little adjustment. Also problematic is the fact that the One S’s screen is plain old Super AMOLED, not Super AMOLED Plus. This, combined with its lower resolution, means that PenTile matrix patterns (jaggy edges around text and other on-screen elements) are more visible than we’re used to on HD Super AMOLED phones. For some people, this kind of aberration will be like nails on a chalkboard. However in our opinion it’s not too bad, and if you’re upgrading from a non-720p phone it probably won’t bug you all that much. It also bears mentioning that the One S’s screen seems to be of notably higher quality than the Droid RAZR, which on paper has an identical display. There are no issues with discoloration at low light levels, and the phone’s auto-brightness setting always keeps things light enough for comfortable viewing. Similarly, we noticed that despite its lower resolution, the One S’s screen seemed brighter than the Galaxy Nexus at equivalent brightness settings, and with more accurate color temperatures to boot. Underneath the screen are your three standard Android 4.0 buttons — back, home and app-switching, and like the One X, these are capacitive buttons rather than Galaxy Nexus-style on-screen dealies. And, yes, just like the One X, this leads to a bit of frustration when you come across an app that needs the legacy “menu” button. Part of the screen has to be reclaimed to make way for a virtual menu key, which is all the more intrusive on the One S’s smaller screen. As we mentioned in our One X review, this should become less of an issue as more apps are updated with full support for Android 4.0 and its standard three buttons. The rest of the One S’s buttons and ports are exactly where you’d expect to find them an HTC phone. Along the top edge is the power button and headphone jack, with the volume rocker on the right and microUSB port on the left. Above the screen there’s a basic VGA shooter for video calls (or checking yourself out in the bundled mirror app). Around the back is an 8MP backside-illuminated ImageSense-powered camera, which will sound familiar if you’ve read our One X review. As on the One X, it’s backed up by a single LED flash. Around the back, the soft-touch plastic area near the camera lens snaps off to reveal the spring-loaded microSIM slot, and nothing else. That’s right, there’s no removable battery or microSD card, so you’ll have to make do with the 1650mAh battery pack and 16GB of internal storage that’s included. We’d rather these things were user-replaceable, but in this instance HTC has sacrificed expandability in favor of sleek, compact design. Generally, this is a price we’re willing to pay, and we’re seeing a slow migration away from expandable storage in many leading Android phones anyway. What’s a little harder to swallow is the relatively meager 10GB of USB storage that remains once you deduct the OS partition and app storage from the One S’s 16GB of internal flash. However you spin it, that’s not a lot of space on a phone with no other storage options. Internally, there’s a 1.5GHz dual-core Qualcomm Snapdragon S4 CPU running the show, along with 1GB of RAM. The S4 (aka Krait) is Qualcomm’s latest Snapdragon chip, and despite “only” being a dual-core CPU, it’s among the fastest smartphone chips out there at the moment. If you’re the type of person who cares about benchmark scores, then rest assured that the S4 routinely matches NVIDIA’s Tegra 3 in most benchmark apps. It’s also the same chip that’ll be shipping in AT&T’s LTE version of the HTC One X, so you’re definitely not going to be short on computational horsepower. As for plain old voice calling, well, the One S does that too. And it does so pretty well — we noticed no dropped calls, and cellular and Wifi reception is comparable to other Android smartphones. Finally, we should note that NFC (near-field communication) support, which is present on the One X, is absent from the One S. We’ve yet to see this technology take off in a big way, but it’s a little disappointing to see it omitted from what’s likely to be a popular handset. The HTC One S runs the latest software from HTC and Google — that’s Android 4.0.3 Ice Cream Sandwich and HTC Sense 4. We’ve been over this in detail in our exhaustive Sense 4 walkthrough, and it’s pretty much the same software experience you get on the One X, albeit on a slightly smaller screen. The look and feel of Sense 4 will be familiar to anyone who’s used an earlier Sense phone, but HTC’s taken a more minimalist approach this time around. Many of the chunky, embossed 3D elements and superfluous animations have been pared back, and the animations that remain show none of the trademark lag that plagued earlier versions of Sense. We’d even go as far as saying that the software experience on the One S is, on the whole, slightly smoother and more responsive than on the One X. The differences are subtle, and you’re not going to notice them unless you’re using both phones side by side, but they’re there. To us, the One S’s software just feels that little bit more optimized. Although the One S runs HTC’s UX layer, there’s little that’s been changed just for the sake of it. The ICS-style dock, for example, remains, complete with customizable icons. All the navigation bar clutter from Sense 3.x has been removed, and replaced with a single settings button, just like vanilla Android. The dedicated task switcher has been re-worked slightly, and now shows larger app previews similar to Windows Phone 7. This means you get to see fewer apps at a time, but that’s balanced by the fact that task switcher will automatically scroll to the last app you were using, making it really easy to hop between two different apps. Despite bringing Sense closer to vanilla Android than it’s been in the past, HTC hasn’t abandoned our favorite features — leap mode in the launcher, the wealth of skinning and customization options and the excellent Sense lock screen are all present and accounted for. HTC’s Trace keyboard (think Swype) is much improved in Sense 4, too. That’s to say it’s actually usable now, and you can type on it without wanting to throw your phone out a window. Sense also retains its considerable multimedia chops, with codecs aplenty, DLNA support and movie streaming through HTC Watch, which offers some content not available through Google Play Movies. And the Sense Gallery app has been expanded to include photos and videos from a variety of sources, including Dropbox, Facebook, DLNA, Flickr and Picasa. Similarly, the Sense music player has been updated with content from SoundHound, TuneIn Radio and the 7Digital music store. And unlike previous versions of Sense, the Beats Audio enhancements now work in all multimedia applications when you’ve got headphones connected, not just the stock music app — good news for streaming music subscribers. Beats remains something of a contentious subject, with some claiming that it does little beyond boosting bass. It’s difficult to quantify exactly what Beats does during music playback, but we’ve consistently found that our stuff sounds better with Beats enabled. That said, in some tracks the combination of boosted bass and clarified vocals can result in playback anomalies. If you own any Beats Audio hardware already, you’ll be pleased to find individual options within the Beats software for iBeats, urBeats, Beats Solo and Beats Pro. HTC’s less intrusive approach to Android is reflected in its new Sense browser. It’s pretty much the same old stock ICS browser we’ve been using on the Galaxy Nexus for the past few months, with just a few additions from HTC. The menu bar has been adapted to include the option to enable or disable Flash on the fly, and bookmarking and tab-switching buttons are now found at the bottom of the page. The latter is largely a matter of personal taste — buttons are easier to hit further down the screen, but since the browser controls hide themselves when you’re not scrolling up quickly, it can be difficult to anticipate when the buttons are going to show up. Social network and calendar integration has been a long-standing feature of Sense, and both are alive and well in version 4. In addition to showing calendar content from Google, Facebook and Outlook, Sense now includes a dedicated tasks area, which can sync with Google’s Gmail task list. The Friend Stream app does a decent job of aggregating social content, though you’ll find better dedicated clients for social networks like Twitter in the Google Play Store. On the whole, HTC Sense 4 builds on Android 4.0 with some useful additions and only a few minor annoyances. Not everyone’s going to be a fan of the look and feel of Sense, but we think the changes that’ve been made in the latest version make it easier to enjoy HTC’s UX, as opposed to merely putting up with it. The HTC One S includes a 1650mAh fixed battery — not the heftiest smartphone battery, but still a respectable capacity. Some will bemoan the lack of removable battery pack, but considering the One S is a 3G/HSPA phone with a 4.3-inch screen, the included battery is more than sufficient. Even with relatively heavy use, including capturing a wealth of still photos with the phone’s rear camera, we struggled to kill off the One S in under 17 hours. HD video recording remains a major battery drain, but that’s true of every smartphone. The One S’s screen is by far its most battery-intensive component, but unlike the One X, we didn’t notice excessive battery drain at high brightness levels. And on a similar note, we were much more confident in the One S’s ability to get us through a full working day. Despite its svelte physique, the One S packs in plenty of juice, and you shouldn’t have to worry about a mid-day recharge. Like its big brother, the One S includes an 8MP ImageSense camera, complete with ImageChip for photo processing, the new HTC Sense camera app, 1080p video recording and all that good stuff. As such, the camera experience you get on the One S is almost identical to that of the One X. Same lightning-fast focus and capture speeds, and comparable image quality. Burst mode has made it across too, letting you capture up to 20 frames in rapid succession. If you’re into wacky filters, you’ll be pleased to see that HTC’s included a great selection of camera effects that are applied in real-time. The One S’s still shot quality is among the best we’ve seen from any phone — its images are bright, detailed and on the whole, free from noise and other artifacts. That’s made all the more impressive by the speed at which the phone captures its photos. And as the camera uses a backside-illuminated sensor, it does an impressive job of capturing images in darker conditions, too. Video recording remains a bit of a mixed bag. We’ve no problems with the quality of video recorded in daylight, but low-light footage suffers the same fate as on the One X — greatly reduced frame rates, down to around 19fps in some cases. To give some perspective, the Sony Xperia S shoots 1080p video at a silky smooth 30fps, even in dark conditions. Despite this one area of weakness, we have no trouble recommending the One S to buyers looking for a great smartphone camera experience. As you’ll see in our sample shots below, it’s possible to capture some genuinely impressive shots in the right conditions, with the right combination of settings. Being an HTC phone, the One S is unlockable via the HTCDev bootloader unlock site. Once the phone’s bootloader is cracked open, you’re free to root it and fool around with ROMs and custom recoveries, if you’re into that sort of thing. Right now an interim version of ClockworkMod recovery is available for the One S, and a few custom ROMs, including MoDaCo, are starting to appear. It’s still early days, but given the quality of its hardware, the ease with which it can be unlocked and its position as T-Mobile USA’s new flagship phone, we anticipate a strong developer following for the One S.
In the One S, HTC has itself an almost perfect high-end, 4.3-inch smartphone for consumers who don’t want to deal with the additional bulk of a 4.7-incher. And on the whole, the compromises that have been made to allow for the One S’s slim figure don’t directly impact the user experience. The main exception is the screen — going back to a PenTile qHD panel is tough — but even that isn’t as clear-cut as the numbers would suggest. That said, it ain’t no 720p SuperLCD 2. We’re sure many — particularly those unconstrained by an existing service plan — will be torn between this phone its big brother. Ultimately, the argument between the two boils down to this — the One S delivers almost all the benefits of the One X in a slimmer form factor and at a lower price point. It also feels better in the hand, mainly because it’s easier to actually fit it into your hand. The two biggest trade-offs you’ll have to make if you pick the One S relate to screen quality and internal storage size. The One S will inevitably live in the shadow of the One X, but it’d be foolish to overlook this device just because it’s not a “flagship phone”. Despite its position in the middle of the HTC One series, this is no mid-range handset. The One S is a smaller, sleeker, leaner version of the X (with much better battery life, we might add), and it’s just as capable a smartphone as HTC’s new flagship. If you can get past the lower screen resolution, it’s definitely worth a look. “HTC is committed to delivering a high quality product and great experience for all our customers. There have been a few, isolated reports of this issue. The finish on the One S was laboratory tested as being at a hardness similar to ceramic. While that’s hard, it doesn’t mean it’s impossible to damage. Regardless, HTC takes quality very seriously and are providing all customers with an immediate fix and we are implementing some small changes to ensure customers do not experience this issue in the future”. I don’t have any information at this time as to whether a matte option for the back cover will be available. However, I am very happy to provide you with the link to the published specifications of the device: [Only registered users can view links. ] . You will notice there is an active link on this page to sign up for information on the phone. I must say, it is a pleasure to read your delightful email today. If you would like any additional assistance, or ever need any technical help with your device, don’t hesitate to email us, or call us at 1-866-(NUMBER REMOVED) (6AM-1AM, 7 days a week). It may sound like a typical generic response, but here’s hoping HTC takes serious precautions and doesn’t allow what happened to the first One S owners to the next group of One S owners— including the EVO 4G LTE owners.